The central most important part of a wedding day is the actual joining together of two families and two people, the bride and the groom. Each person and family brings into the marriage certain beliefs, ideas, ideals and personalities which come together to make whole new families. The choice of ceremony spot is an important statement from the traditional and religious aspects of weddings. Which church you choose tells of under whose authority you are getting married, are you following God's commandments in getting married and are you following the traditions of your ancestors? Many churches are also ornately decorated and designed and can add a grandure to your wedding day. 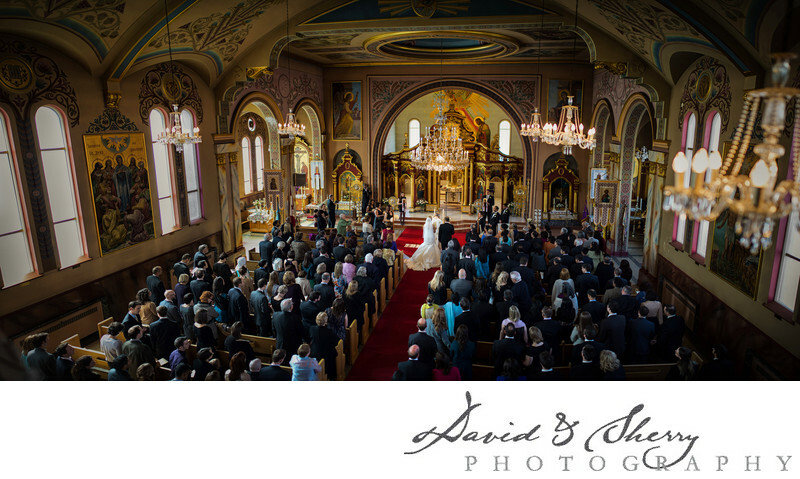 St Volodymyr's Ukrainian Orthodox Cathedral is one of the most beautiful churches for weddings in Toronto because of it's large windows letting in lots of light and the gold wall murals and chandeliers contrasting against the red carpet or aisle runner leading up to the alter where the equally beautifully dressed priest marries two people under God. The balcony also allows us as photographers to capture the entire church in one photo with all of your guests in attendance. We love taking pictures at this beautiful Toronto church. Location: 400 Bathurst St, Toronto, ON M5T 2S6.